One thing I always get asked about is what makeup I am wearing and I would like to think that is a compliment to my face looking semi alright and the only reason it generally looks ok is due to good makeup! I would love to be one of those women who can get away with minimal to no makeup but I have had to accept a long time ago that I need a little help in that department. I also love makeup, as well as applying it, and for a long time I actually considered being a makeup artist. Since going cruelty free three years ago I have had quite a lot of time to experiment with different brands of makeup to find the products I really love and am happy to buy again and again. At the time it was quite tough going from only using MAC products to suddenly being thrown into the deep end of finding quality cruelty free makeup on the high street and online. To my surprise there was a lot more choice than I had initially imagined but if anything that made it harder to find my all time holy grail products. As I am a blogger I am generally always trying out new makeup and so my favourite products do at times change if I discover something better than what I was using before. But as it stands these are my current and up to date favourites which I wear on a daily basis. These butter glosses by NYX are my go to daily lip wear as they are such good value for money at only £5.50 each and they're great quality glosses. They also have a few shades which I really love, notably Creme Brulee and Tiramisu. I love how my lips feel so moisturised when I am wearing these glosses and they really do have some decent staying power. Also, they may look quite small but they really last me quite a while longer than some other lip glosses i've used in the past. I have bought this Body Shop bronzer so many times over the years because it's one of the only bronzers I have managed to find that has a nice shimmer, without being glittery, and which doesn't make my face look orange. This bronzer has a miraculous way of giving you a subtle warm sun kissed glow that looks natural. I wear this bronzer daily and it lasts so long, I think I only need to buy one a year. It's also vegan friendly! For so long I only ever used to use eyebrow pencils and then one day I discovered this little gem of a product and I have never looked back. The Makeup Revolution Eye Brow Kit contains three different shades and one wax cream. I find that the wax really helps the powder to glide on so easily whist also helping any wild hairs to stay in place. This kit gives my eyebrows so much more definition than any pencil was ever able to and its so easy to use. I really couldn't imagine ever using anything else on my eyebrows now. When I first went cruelty free I had the most difficult time finding a foundation that I loved as much as my previous MAC one. I tried so many and yet none seemed to even come close, until of course I tried Too Faced Born This Way. After turning my back on MAC I was quite looking forward to not having to spend so much money on makeup anymore but some products, like foundation, are worth paying the extra for when they are good quality. This medium to full coverage foundation does everything that I need it to do and more! It not only covers up imperfections but it's also really hydrating and helps my skin to look bright and natural. It's also vegan friendly too. The only downside for me is the £29.00 price tag and how quickly I seem to get through a bottle. But, as it's the most important product in my makeup collection, I will continue to stick with it until the day comes where I find something as good as this for cheaper or an overall better product. I always used to apply my foundation with my fingers which, despite working pretty well, was a bit of a pain in the arse as it tended to make things a lot messier. I was recommended to use the Real Techniques Miracle Complexion Sponge instead and I was surprised by how much I preferred using a sponge to my fingers. It really did make a world of difference to how my foundation blended but I wasn't very happy with the longevity of this sponge which is why I decided to try out the much hyped Beauty Blender. I didn't think there would be much difference between these two sponges but I was so wrong. The Beauty Blender is one of my favourite makeup products of all time and, although the £16.00 price tag seems extreme for a sponge, it will last you months and months longer compared to the Miracle Complexion sponge, which when washing used to disintegrate in my hands after only a few weeks usage . I like to wash the Beauty Blender frequently and use it damp to apply my foundation as it just seems to help the foundation go further and it helps to give my skin finish a more dewy and radiant look. Occasionally I will treat myself to a more higher end makeup product that I am keen to try like this Jeffree Star Skin Frost highlighter. After seeing it in a few You Tube videos I really loved the look of it and how well it works at highlighting the skin and those all important areas like cheekbones. As soon as I started using Skin Frost for myself I was really blown away by the quality and sheer luminosity of this product. Ever since I have been wearing it I have also received so many comments saying I look 'glowing' which really proved to me that this highlighter works! I would 100% buy this again but as yet I haven't needed to as i'm pretty sure that, despite its regular use, it's going to last me at least a year, if not longer. Even though this product is listed as more of a highlighter on e.l.f's website I have been using it as my daily go to blusher. The 'Pink Lemonade' shade has a really lovely shimmery pink colour to it and I find that it makes the perfect all in one blush and highlighter. Some people are put off by liquid blushes but I really do prefer them to powder based ones as they just seem to have much more longevity and they also apply really easily. This is quite a pigmented product so you only need a small amount to get the desired look and this also means that it's a product that goes a long way. e.l.f have always been one of my top favourite vegan and cruelty free brands and I think they're the perfect products to turn to when initially going cruelty free as they're such amazing value for money. Word on the grapevine is that we'll soon be able to buy their products in store at Superdrug which I for one am really looking forward to! For the past year my favourite mascara has been Lash Vegas by Barry M and it's a product I have repurchased a number of times. Unfortunately, and for some unknown reason, Barry M have now discontinued this product which is such a huge shame and I was pretty distraught when I found out. I am currently on my last tube of this mascara which means I shall soon have to find its replacement but I have heard that Barry M's That's How I Roll is the best like for like replacement so I will be keen to give this a try pretty soon. When Colour Pop offer free international delivery I take advantage of it because their eye shadows are to die for! I am a huge fan of their Super Shock Shadows in particular which come in a wide range of highly pigmented and beautiful shades. These shadows are seriously like no other I have tried before and I think that could be due to their combined creme / powder consistency. They feel so amazing to use and blend it's unreal! Beware though - you may be stung for a customs charge when ordering from them. My makeup brush collection has been going from strength to strength and lately its been getting bigger by the month. The main three vegan and cruelty free brands of brushes that I use the most and love the most are Spectrum, Nanshy and Real Techniques. 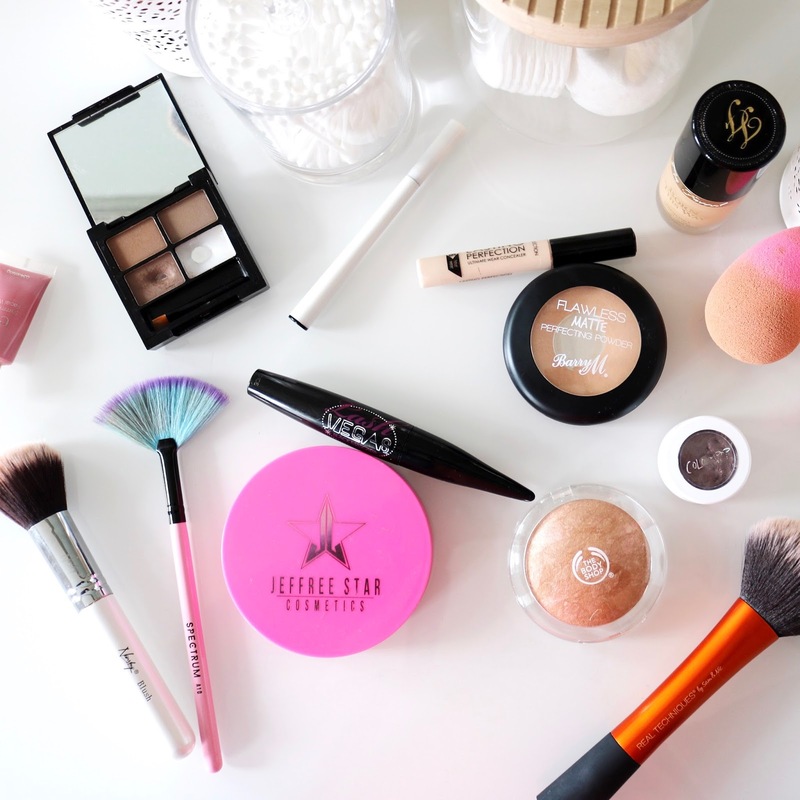 If you're looking for a great quality synthetic makeup brush then you really can't go wrong with any of these brands. Did I mention any products that you already love to use? I'm surprised that the Jeffery Star highlighter looks so pink in the pan for a highlighter. Can you use it as highlight where you wouldn't want to add colour?